August 10th is suddenly upon us and that means the start of the English Premier League season as Manchester United play host to Leicester City at Old Trafford. Hawkeye Sidekick runs the rule over the twenty teams on the starting blocks. City still the team to catch? The century point winning league champions were the standout team of the league last season. Their passing game was too much for the rest. City have secured the services of Mahrez from Leicester City, an excellent squad depth signing. City are happy with their defensive setup and will hope that Vincent Kompany is injury free this season. Stones and Otamendi will have come on from their World Cup experience. The midfield is stacked with quality and De Bruyne, Sane, Silva will look to continue where they left off last season terrorizing league defenses. The attacking options for Manchester City will be in the form of Aguero and Jesus and they should be expecting plenty of opportunities to score given the players around them. They are the side to beat this season and are a good bet (provided the players are hungry for further glory) to retain their title. Pep also wielded the axe during the off-season. Toure and Hart bide farewell from the club; two players who have had indifferent relations with the manager. Several promising young players have also left the club for first team opportunity with Angus Gunn looking to impress at Southampton. Liverpool poised to deliver title push? Is this the season where Liverpool deliver a league title? This is a crucial season for Jurgen Klopp and squad given the investment on new talent this off-season. Four marquee signings may their debuts for the club this season. Fabinho, Keita, Shaqiri and Alisson will need time to settle but in doing so, will Liverpool lose valuable points to the likes of Manchester City early doors? A second season for Mo Salah to confirm his talent and goal scoring prowess; an opening day home fixture against West Ham United should be the perfect platform for the player and club to start the season in the right fashion. The defensive side of the team has being highlighted last season but the central defensive positions look strong. van Djik and Lovren struck an effective partnership in the second half of last season. Robertson and Alexander-Arnold are two full backs full of potential and pace. The keeper situation has being addressed with Alisson but the Brazilian keeper will need to answer early questions on his aerial ability. If he can come through this unscathed, Liverpool are in with a great chance of securing a much coveted league title. Tottenham content with squad depth? For the first time since the transfer window was introduced, Tottenham Hotspur decided not to sign any player (much to the disappointment of Jack Grealish). The club have sent out the statement that squad depth is sufficient as they prepare to move back to the Lane. The home fixture with title rival Liverpool should be a standout moment of the season. Massive onus on Harry Kane to continue to be the main man to score the goals. Alli, Song and Eriksen will provide the creativity and flair in the side. The question is when Kane is injured, who will provide the scoring threat? Defensive solid with the likes of Vertonghen and Sanchez in the ranks, expect Trippier to become an even more prominent player from the set piece given his impressive World Cup cameo. The question is with respect to the striking options when Kane is injured or unavailable for team selection; it is the biggest concern for the club and Llorente will need to contribute more than last season which was brief cameo appearances. What to expect from United this season? A mixed bag truth be told. Can the manager get the best out of Paul Pogba who showed with France this summer that he is capable of playing a disciplined midfield role? The prospect of Matic being absent for the start of the season places pressure on McTominay and no discernible replacement for retired Carrick. It has being an interesting off season at the club. Early summer signings with Fred the standout but the end of this window has proved increasingly frustrating. The chase for a central defender foiled several times; Maguire, Godin, Boateng and any other defensive player they approached were out of reach. A messy end to transfer dealings which has only increased Mourinho’s frustration to the media yesterday. The performance of Sanchez will be keenly watched; an interrupted preseason showed glimpses of brilliance from the player and he will need to be the focal point for attacking flair in the side. Rashford and Lukaku will be the main scoring threats as Martial looks primed to play a peripheral role given his extended absence from preseason. A season where Mourinho may decide that it is time to look elsewhere; the dreaded third season in charge, watch this space. United are not winning the title and top four is the priority this season with a cup run the likely outcome. The start of the Unai Emery era at Arsenal. The Arsenal TV fans will need to give the experienced manager the time to settle into the club. There have being key departures from the squad. No Mertesacker, Wilshere, Cazorla in the squad but Arsenal have secured the services of Lichtsteiner, Leno and Papastahopoulous who should contribute from the opening weekend. What to expect from Arsenal this season? It is a good question. A daunting home game to start against Manchester City but the new manager will look for his side to express themselves with the ball and be compact when in defensive duties. Patrick Aubameyang should enjoy an excellent full season with the club; his pace, power and scoring prowess should see Arsenal take a couple of top four scalps but defensively there are concerns particularly in the central defensive areas. Top four finish is the priority for the club. Are Everton the dark horse top four bet? Everton have had on paper a strong transfer window and the board have backed new manager Silva in the transfer market. Richarlison is a risky buy given his record with Watford. Where now for Cenk Tosun? Digne from Barcelona will provide good options in the full back berth. Bernard, Mina and Gomes if they can settle quickly into the side are quality additions. Mina has the skill set, power to settle the Everton defensive issues seen last season. Silva is a well respected manager but the fact that he has being dismissed by Watford last season has cast a shadow on the appointment. Will Silva last the full season? Everton need a stable managerial tenure to grow but Silva has questions to answer particularly when the club have backed the manager to the hilt. The fact that Jordan Pickford remained at the football club was almost another signing in the off-season as well as the fully fit Seamus Coleman to the ranks. This is a season which could deliver great promise for the club provided that they start the season well. Everton were shrewd in their departures this off season. They cut their losses on Klaassen and Williams who did not settle at the club. The fortunes of the club rest on the new manager and Silva needs to deliver. Top six is attainable given the personnel assembled. Sean Dyche and squad should be applauded for the sixth position in the league last season. UEFA Europa League secured but it brings its own challenges to the club. The squad depth will be fully tested this season and if early season form dips, an uncomfortable relegation battle will ensue which would be a big disappointment. The goalkeeper crisis at the club forced Dyche’s hand and it has provided Joe Hart with the perfect opportunity to restore his reputation as a top keeper in this league. Given the side’s defensive organization is usually on point, Hart should revel in the surroundings. When Pope and Heaton come back to the first team squad, the competition for the number one jersey will be epic. Other transfer dealings were to reinforce the defensive squad depth with the capture of Gibson and Vydra arrives to bolster the attacking options. If Burnley finish in the top half of the table given their UEFA Europa League commitments, it would be regarded as a good season. The departure of Mahrez from the club has being long in the offing. It is now a reality and we will see if the likes of Gray can fill the shoes and provide the ammunition for the likes of Vardy to score the goals. Claude Puel and club held their ground with Manchester United’s advances of Harry Maguire. The England international defender will play a key role in the side defensively and with Kasper Schmeichel still at the club, the side look extremely strong defensively. The squad has being reinforced with the signings of Pereira (Porto), Evans (WBA), Maddison (Norwich), Ward (Liverpool), Ghezzal, Benkovic (Dinamo Zagreb) and Soyuncu (Freiburg). Maddison is a player of tremendous upside and is one of the young players to watch in the league this season; good feet and his delivery from set piece should create goal scoring opportunities. The attacking options without Vardy is the chief concern for the club, a top eight league berth should be attainable given the experience and defensive cover signed. Gray will be asked to be the Mahrez effect at the club. The Championship winners from last season have wasted no time to strengthen their squad depth for the challenge of the top flight. Exciting signings come in the form of Boly, Patricio, Moutinho, Traore. Afobe arrives with EPL experience from AFC Bournemouth and then you have one of the potential shrewd signings of the window with Leander Dendoncker arriving to bolster the midfield ranks. I am genuinely excited to see how the new signings blend in with the current squad and their footballing style was so easy on the eye last season. The time to integrate the new signings is key here and could be an issue early doors but expect Wolves given their squad quality to have more than enough to secure a respectable mid-table position. Moutinho’s experience to midfield also a real positive for the Midlands club. A quality addition to the league; great stadium and fan base. Eddie Howe has being given transfer funds to bolster the squad after an inconsistent past season. The performances were a mixed bag and the squad needed rejuvenation. Several squad members have departed the club. Arter , Gradel and Federici lead the list. Howe has reinvested in the squad with three targeted signings. Brooks arrives from Sheffield United, an exciting midfielder who will look to create from the wide channels. Rico is an established La Liga defender who comes from Leganes and their chief summer target was finally secured with the capture of midfielder Jefferson Lerma from Levante. The team’s passing style is lovely on the eye but do the team have sufficient quality at both ends of the pitch to contend in the UEFA Europa League race? Initial answer would be no and I think mid-table position is the prediction for the club this season. King and Wilson will be required to produce the goods upfront. This is a season into the unknown for Chelsea. The unceremonious dismissal of Antonio Conte resulted in the appointment of Maurizio Sarri from Napoli. The managerial appointment will have to be judged on its merits as the season progresses but a good start is vital for the Italian to win over the board and fans that he is the man to lead the side on. The off season has seen the departure of Thibault Courtois to Real Madrid. Kepa and Kovacic arrive to offset the loss but the two new arrivals will take time to acclimatize to the EPL style of play. Chelsea’s keeper options are Caballero and Green; enough said so the signing of Kepa is a win or bust scenario. The potential signing for Chelsea of most promise is Jorginho, the player had a superb season with Napoli last season and will provide the side with attacking and defensive nous to complement the likes of Kante and Fabregas in the side. The big question upfront is whether Morata can fulfill his potential and start to score goals on a regular basis. After a strong start, confidence quickly faded from the Spaniard with some glaring missed opportunities. If Morata fails to fire, questions will be asked of the side in the attacking department so more onus on Hazard to rescue the side. I don’t see Chelsea as a title contender this season. The new head coach is an unknown quantity and his ability to adapt quickly to the EPL will be key for Chelsea to have a successful season. Chelsea will pick up momentum as the season wears on but early season dropped points will prove costly. Potential top four finish but it will be a close run thing. Chris Hughton has being backed in this transfer window with several arrivals of note which will look to increase squad depth and quality. Defensive options are boosted with Balogun, Bernardo and Montoya. Goalkeeper competition is increased with Steele and Button’s arrivals. The attacking options see Andone, Jahanbaksh (club record signing), Dreyer to provide goals and support to the likes of Glenn Murray. The middle of the park now contains Bissouma who will be well suited to the league. The key point for the club is how quickly these signings bed in and start to contribute. A quick start is required; otherwise Hughton may be looking over his shoulder as fans and board start to become impatient. Brighton & Hove Albion should be well safe this season; top half finish is a realistic aim. Roy Hodgson and squad deserve massive credit for their great escape last season. A dreadful start to the season saw the De Boer era finish as soon as it started and it was up to local boy Hodgson to pick up the pieces with the club securing their top flight place this season with a couple of games to go in the season. The club has seen key arrivals and departures. Guaita is a key acquisition to increase competition for the number one spot. Kouyate provides defensive and midfield presence for Cabaye who has left. Zaha is the standout goal threat but there needs to be more goal scoring threat. Benteke will look to right the wrongs of last season but Hodgson is looking for alternatives as Max Meyer and Jordan Ayew arrive to bolster the strike force. Meyer potentially is a dark horse. Ayew is a mystery; not sure of the lure for the player who has not delivered for Swansea last season. Palace will look to Zaha for the attacking inspiration and there will be moments of anxiety defensively but the side are well placed with Hodgson to reach forty point and secure their place in the league next season. Mid-table finish. Rafa Benitez is a worried man. The lack of off season activity from the club means that the manager will have to use all his tactical nous to stave off a lengthy relegation battle. Dubravka and Kenedy were key recruits at the start of the calendar year. Muto, Rondon will look to provide the goals for a side who struggled in this department last season. Fernandez signing is astute; defensive experience but nothing standing out in terms of any summer arrivals truth be told. I fear for Newcastle United this season; thought this off season was an opportunity missed by the club to consolidate their league position as clubs around them have invested big in their squads, sense a relegation battle and if Benitez walks away could go down. Last season was a scene from Dream Team for the football club. Fan protests against the board, fans invading the pitch were all too common. The board have responded with support to Pellegrini in the transfer market and the recruits joining look potentially astute. Fabianski is a goalkeeper well respected in the league and he will provide excellent squad depth with Adrian. All areas of the pitch have being covered with particular attention on Wilshere for the coming season. If the player can remain fit, his passing style and play will be ignite West Ham as an attacking side. The striking options will see Arnautovic playing a key role; the Austrian was superb in the second half of last season and will be the main target man. Squad depth looks on point with the acquisitions of Anderson, Yarmolenko as well so the club should not be in a relegation battle this season. Top ten finish potentially if the side can start the season with aplomb. Otherwise, fan hostility to the club and team will intensify leading to a hideous atmosphere and relegation battle will loom large. Huddersfield Town did something no-one expected last season; stave off relegation. A great achievement for the town, the club, the squad and the fans. This season sees added challenges for management and playing group and the sense of surprise is no longer a trick card to play for Wagner’s side. Experienced campaigners in Whitehead and Green have departed and the arrivals are uninspiring. Sobhi struggled for form at Stoke City last season. Hamer will provide backup for Lossl. Durm, Kongolo, Diakhaby and Mbenza are quite frankly unknown quantities which is a worry and concern. Dressing room leadership is further eroded by the loss of Hefele who has left for Nottingham Forest; a popular figure around the club. This is a season where the harsh realities of EPL life will be exposed; do not see another fairytale survival this season and could be down by next March. An early season winning stretch is required to have any chance as squad depth will be ruthlessly exposed. Mark Hughes must have being a relieved man at the end of the season. He staved off relegation with Southampton which he could not do with Stoke City who were well on their way to the Championship when he was sacked. Southampton have responded with that near miss with a shrewd transfer window. Tadic has left for Eredivisie and his replacement comes in the form of Stuart Armstrong from Celtic. Angus Gunn arrives with an excellent reputation and will provide additional keeping squad depth for Forster, McCarthy. Vestergaard has the ability to be an excellent defensive and set piece signing. Danny Ings will provide pace and goal scoring nous for the side who struggled in front of goal last season (particularly Shane Long). A season of consolidation and I suspect Southampton may have to battle for a time around the lower half of the league before moving away from relegation trouble by Christmas. Hughes and January transfer window looks pivotal if they harbor any aspirations for a top ten berth. Fulham have had an active transfer window with several marquee signings in all areas of the park. Seri was an early standout signing. The Nice player was courted by the likes of Liverpool before deciding to join Fulham. Schurrle provides a wealth of EPL experience from his time at Chelsea. Mitrovic provides attacking and goal threat; a player who could be a key player for the side if he hits the ground running. The new signings will provide good quality depth options for management to complement the talent of Cairney and Sessegnon who will look to impress in the top flight; two superb young talents. With an owner looking for the club to grow at a massive rate, the world is at Fulham’s feet and if a deal to purchase Wembley is pulled off, the revenue streams could be incredible. Top mid-table position to start off their top fight stay. Neil Warnock has done a superb job at Cardiff City, a club who were spiraling out of the control before his arrival. His classic man management approach has worked a treat and the side were a cohesive unit last season with the likes of Hoilett, Connolly, Etheridge to the fore. This season has seen several key signings to complement the talent in the squad containing Gunnarsson, experienced operator in both international and top flight level. The issue is that the arrivals lack top flight experience, good Championship players who are looking to get to the next level. Only Harry Arter has EPL experience from the players signed and this is a concern if the new arrivals such as Murphy, Reid, Camarasa, Smithies struggle early doors. The fact that Warnock has not kept a team up in the top flight is another concern whose post-game comments could get the manager into disciplinary trouble. After a promising start, squad depth and experience will kick in and I sense that Cardiff City could be relegated come next May. January transfer window will be pivotal for the club to acquire key loan signings to stave this predicament. Watford are a mysterious club; they wheel and deal managers and players like no one else in the league and this off season was no different in the squad department. The marquee signings of Deulofeu (Barcelona), Navarro (Barcelona), Foster (WBA), Sema (Ostersund) will provide strength in depth but the side have being inconsistent over recent seasons at the cost of the manager who has being sacked. Silva was shown the door last season and Garcia will get the same treatment if Watford perform in the same vain; don’t think they will go down but might struggle at the bottom half of the league for long stretches so the games against teams around them will be key. The big issue for Watford is who will score the goals in the side with the departure of Richarlison from the club? Interesting to see how Garcia manages that big issue if he is given the time. Lower half of the league with the odd top four scalp thrown in for good measure; their inconsistency must drive their fans demented. The FIFA World Cup withdrawals have started to ease as we enter August and that means one thing and one thing only, it is the start of the English Premier League. Thirty-eight rounds filled with excitement, drama, horrific officiating decisions and sublime moments of skill to win key fixtures. The banter has started in earnest amongst my friends and this season, Hawkeye Sidekick will summon the courage to chart his progress as the season progresses. In this opening article, we will look at his opening season fixture team selection. The words hope and fingers crossed come to mind. My past seasons with Fantasy Premier League have being horrific; last season was a particular low point as a couple of bargain buys in week one for the likes of Erik Pieters, Jeff Cameron (don’t laugh) got what they deserved; utter derision and slagging from my friends and no points on the board. I gave up after the week eight such was the gap to everyone else, hoping that the team would produce miracles in my absence (or let the players mature and improve). Nope, it did not work. My team selection looks okay on paper but there are a couple of potential gotchas in the mix for this weekend. What if Arsenal beat Manchester City? Bye Bye Ederson clean sheet and potentially subdued performances from Sane and Sergio; knowing my luck that will happen. Alexander-Arnold, Azpilicueta and Vertonghen should deliver good points throughout the season. The Liverpool youngster hopefully providing some good assists and goals this season, nice price if I am may say so myself. There is a bold leap of faith with the newly promoted teams. Neves from Wolves is an interesting selection; his scored an absolute screamer last season but will he able to step up to the top league? Sessegnon is a player of undoubted potential, hope rather than optimism on those picks. Mo Salah hopefully rescues the situation; a fixture at home to West Ham United who look defensively short with the absence of Reid a good omen. Rashford and Zaha will provide the attacking scoring threat to supplement Aguero who should have another standout season. 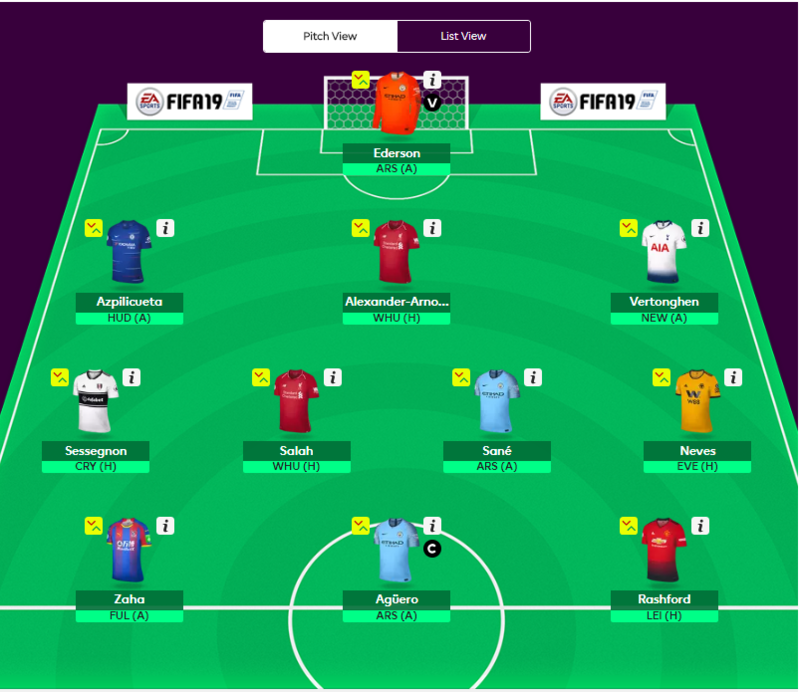 Time for you good readers to poke holes in this team selection; looking forward to the season kickoff, hopefully I am still respectable by the time week eight comes around this season but given my past track record in this format, it is 50/50. Best of luck everyone! I have the FIFA World Cup Russia 2018 withdrawals today. The prospect of no soccer today was disappointing but it is time to reflect on the tournament as a whole. The hosts held a superb tournament for the most part. Hawkeye Sidekick reflects on the tournament and gives out the best and worse gongs. A couple of standout moments come to mind and unfortunately it is all South American themed. Argentina were shambolic both on and off the pitch. A team deeply divided, a team whose coach could have easily being a Sunday League pub team gaffer such was the control that Sampaoli had during this tournament. Argentina were lucky to get out of their pool. Nigeria had them where they wanted them but did not get the job done. Messi struck a forlorn figure during this tourney. The absence of Dybala was a disgrace and Sampaoli conceivably should have gone after the Croatian result. A team on a downward spiral. Messi would do well and retire from international football. The Argentinian national side is in crisis and an embarrassment much like Diego Maradona whose cameos at the tournament were nauseating at best. The Spanish meltdown sacking their head coach before the tourney or VAR would normally get the crown but Argentina were at a different level of embarrassment in this tourney. The sight of Neymar rolling around the pitch resembled an injured bird after hitting a clean window. This was a tournament where the Brazilian Superstar was supposed to be the main guy; the guy to take over the mantle from Ronaldo or Messi. Wrong. The player had some excellent moments but there were disgraceful con jobs along the way. Belgium beating Brazil was the most welcome victory of the tournament; if only to get rid of Neymar whose stock value has devalued to the extent that PSG may struggle to offload the player even if they wanted to this summer. Colombia. Easy decision. Four years prior, Colombia played superb passing football but thoughts of their elimination from the tourney saw a different side to the Colombian side. The side were cynical as early as the opening exchanges against Japan. An early red card for deliberate handball was the prelude. Senegal and Poland wins subtly dampened down the dirt factor but their performance against England was deplorable. Hatchet job comes to mind; the Harry Kane penalty in normal time belied belief. Colombian players kicking turf from the penalty spot. Their antics around the referee throughout the tournament beggared belief. Their capitulation in the penalty shootout was a fitting exit for the side. France flirted with the neutral with their attacking prowess against Argentina and also in the second half of their World Cup final win over Croatia. However, defensive solidity was paramount and they miss out on this award. Belgium and Croatia for me were the teams that were easy on the eye, loved their style of play, passing football. Hazard, De Bruyne vs. Modric and Rakitic. It is so hard to chose. Seeing as both side did not win anything, they jointly win this reward for their cameos in the tournament. England media. Well done England for securing a World Cup semi-final berth but the record ignoring the win over Panama (pub side), there was ample precious attacking moments from open play. Set piece execution was the pivotal attacking weapon of choice for England. Kane’s goals secured a quarter final berth and then Sweden came with a shockingly poor performance. Southgate is realistic; the side are going in the right direction but the side have some way to go before being considered a contender in a tournament of this stature. The losses to Belgium and Croatia exposed composure and skill shortcomings to the max in the side. England media can calm down again. Japan. Their performances were a breathe of fresh air; incredible honesty and ethos to their play. Pundits will ridicule their tactic of all out attack against Belgium at the death in the last sixteen round but it was so adventurous; a change from the standard negativity and hold what you have approach. Martin O’Neill would have being disgusted. Their games were high octane and their never say die attitude was one of my personal favorite moments. A couple of manager’s come to mind. Carlos Queiroz had Iran superbly organized and with a little more conviction in front of goal should have secured a second round berth. Gareth Southgate to lead a limited England side to a semi-final berth; most unexpected. Roberto Martinez for orchestrating the best half of tactical football in their defeat of Brazil. Didier Deschamps for me is the manager of the tournament; to even get Paul Pogba to execute at the level of performance in this tourney was outstanding (given his difficulties at Manchester United). Squad depth was abundant but the ability to create the cohesion defensively and attacking wise was seen at different points of the tournament. The water carrier has done well indeed. Easy decision. Luka Modric creativity, game management and goal threat was seen to the fore throughout the tournament. The mercurial genius was unfortunately on the wrong end of the final result yesterday but his cameos in the previous rounds oozed class. France are World Cup champions, a second triumph in this competition which sees Didier Deschamps join an elusive club of player and manager who have won the coveted crown. Croatia left everything on the pitch but France particularly in that second half showed why they are deserving champions. Hawkeye Sidekick identifies a couple of talking points. VAR was supposed to assist match officials and get the key decisions right. In the opening period of this final, France got the benefit of the doubt in two key decisions which led to goals. The free kick awarded to Griezmann prior to the opening goal was soft. The innocuous penalty appeal from France when Perisic’s arm hit the ball while in the air was incredibly harsh. VAR missed the opening incident and with no insight into the discussions that arrived at the penalty decision, mystery abounds. Did all the VAR match officials agree that it was a penalty? There is zero accountability in how the VAR decisions are made. This needs to change or it needs to be scrapped. Croatia can feel hard done by on the first two goals but it showed issues in their defensive shape at the set piece. The opening goal was a tragedy. Communication breakdown in the Croatian defense which forced Mandzukic to head the ball to nowhere in particular, unfortunately it was not in his own goal. Vida and Lovren needed to do better on organizing their side at the set piece. The Perisic handball was harsh but the player’s positioning was not great to start off with, not tight enough defensively. France’s power and pace upfront as Croatia committed further players forward was seen to full effect in that second half. Pogba began to step his authority on the game; probing deep runs and his goal was superbly well taken as Croatia failed to track the towering midfielder’s threat to make it 3-1. The fourth goal was not long in coming; further space for France to exploit. Mbappe emphatic with the strike. Croatia tried hard but they were exposed defensively at various intervals despite playing attractive football led by Rakitic and Modric. The central midfield performance today typified this. Kante with an early yellow card was walking the tightrope and the Chelsea player dared not to make a tackle. Deschamps reacted and took the player off for Nzoni. The move worked a treat. Nzoni zipped into tackles and Croatia’s key threats in Rakitic and Modric suddenly were not afforded the space and time enjoyed when Kante was on the park. France’s squad depth in this tournament has being superb; the ability of players to support others and execute the game plan has being to the fore. Pogba’s performances in this tournament have grown in stature. Maituidi was heroic throughout. Kante was a mountain where opposition attacking options wilted in his presence. The attacking options were in cohesive unison today. Griezmann was probing with his intelligent runs in front of Giroud who led the line well. Mbappe was a constant source of angst for Vida today. France defensively were the strongest side in this tournament. Lloris’ gaffe aside, the French back line has oozed class. Pavard, Hernandez providing defensive shape out wide while supporting their attack. Varane and Umtiti were the standouts in the central defense. Few can argue that France did not deserve to win this tournament. The system was conservative and controlled but the results produced a World Cup triumph. Deschamps is justified in his tactical ethos and with the age profile of this playing group, who is to say that this side will not retain this competition in four years time? Well done France. Enjoy the celebrations! After all the drama of the opening round and subsequent knock out rounds, there are two teams still standing. Croatia and France face each other in the World Cup final. Hawkeye Sidekick reflects on the key match-ups. The performance of the France central midfield was immense in their defeat of Belgium this week. Kante, Matuidi and Pogba executed the game plan to perfection providing defensive cover at all times and providing their attacking players with quick ball. Kante has had a superb tournament; his ability to cover for team mates defensively, his ability to break opposition attacking play are hallmarks. Matuidi has being heroic in his overall work rate and defensive play. Pogba has improved as the tournament has progressed and will the Manchester United star save his best tournament performance until the final? Solid unit and one which has being instrumental in the side’s progress to this point. Croatia’s star players in Modric and Rakitic will do well to break down this unit tomorrow. Luka Modric has being the Croatian standout in this tournament. His performances in this tournament have being outstanding in terms of game management, passing game and goal scoring ability. Modric faces his toughest challenge tomorrow against Kante and Matuidi who will look to negate from minute one. It is down to Croatian’s other stars to perform thus allowing Modric the time and space to deliver a match winning performance. Perisic, Rebic and Rakitic need to be prominent with the ball early and force French midfield deeper allowing Modric to create attacks deep in French territory. Mandzukic upfront will look for decent service; his form was excellent against England midweek, two opportunistic goals, more of the same is required. France’s back line has being imperious in this tournament. Only one goal conceded in the opening round of games. If you eliminate the Argentinian round, they have being rock solid. Umtiti and Varane have being outstanding and the full backs Pavard and Hernandez have provided sufficient width in defensive and attacking play. Croatia have had their struggles in the knock out rounds. Denmark, Russia and England have probed and scored. England should have scored more than the one goal in their encounter. Croatia will look to Lovren and Vida to be rock solid but I have question marks on this point. Croatia do give chances away and no better side to exploit this in the form of Griezmann, Mbappe, Giroud. Lloris has being the standout keeper of the tournament. His save from Alderweireld was a pivotal point in that semi-final win. Lloris has vast experience at this level and the fact that he has now gone 180 minutes without conceding a goal means that France defensively are coming into this final in a good head space. Subasic has being heroic in the Croatian goal. His penalty shoot out heroics to the fore. Injury problems against Russia has not prevented the net minder from having a superb performance against England. His save from Harry Kane was a key semi-final moment in midweek. Two standout keepers. Hoping Croatia can score an early goal to force France to show their attacking prowess but I see only one winner in this final. France have the advantages in all areas of the pitch for the exception of Modric. France to win this encounter potentially 2-1. Deschamps to become a World Cup winning manager along as a player. Unreal achievement. France advanced to the World Cup final on Sunday with a composed, efficient performance to defeat a Belgian side whose bright start descended into ultimate disappointment. Hawkeye Sidekick reflects on the action. This was the key component of this fixture. France were dominant in this area of the park. Kante, Matuidi and Pogba were on point throughout. They negated the threat of Kevin De Bruyne so much so that the Manchester City midfielder was forced to receive ball deep in his own half. Eden Hazard had a superb opening cameo but was then snuffed out by the French central midfield. Kante and Matuidi in particular provided energy and work rate to proceedings, something that Fellaini, Dembele and Witsel struggled to match. Mission accomplished from the French central midfield and Deschamps should be given enormous credit for the manner in which his central midfield setup and executed the game plan. I will cut to the chase. This was the opportunity for Belgium to win a World Cup. Their golden generation will not have a better opportunity to win the coveted trophy with the likes of Spain, Germany, Portugal, Argentina and Brazil dispatched from the competition. Belgium looked like they played their World Cup final against Brazil; the effort to win this contest was evident in the central midfield performance tonight. Perhaps, a good opening thirty minutes of the contest where Belgian dominance should have yielded a goal. Lloris save on Alderweireld was a key turning point; thereafter France imposed their will on proceedings. When you consider the Hazard effort in this opening period, luck was not on Belgium’s side. A heartbreaking loss for Belgium. The talent is there but there are questions on the squad given some underwhelming performances tonight. Lukaku only touched the ball twenty-two times. I rest my case! The game winning goal came out of nothing. While Belgium and Chadli struggled to find their range on the set piece, France executed their corner kick set piece to perfection. The run from Umtiti to first stave off Alderweireld and then beat Fellaini to the flick on was sensational. The header gave Courtois absolutely no chance. Belgium on the other hand struggled for attacking cohesion. Martinez throwing caution to the wind soon after the goal, pumping crosses into the French box where Varane and Umtiti were imperious. No imagination from Belgium to run with the ball and their final ball was not good tonight. France scored and perhaps on another day could have scored a couple more goals at the end when Belgium went all out attack. I think France will be installed as warm favorites ahead of Sunday’s final. Their performances to date in the knockout rounds have shown different attributes of the side. France exposed a poor Argentinian defense and showcased Mbappe to the fore. The quarter final victory over Uruguay was the standout for me personally. They nullified the Uruguayan middle third and with their expansive full backs of Pavard and Hernandez providing support in attacking positions, Uruguay were under pressure from the early exchanges. Their central midfield ability to link play while providing the protective shield to their back four is incredible. Offense wins games. Defense wins championships. This side have a point to prove after their 2016 Euro Championship final loss. France will relish playing either England or Croatia who conceivably may go deep into extra time again. France are primed for World Cup glory unless England or Croatia can throw something completely off the charts to cause unease in the Le Bleu camp. The water carrier has done well, don’t you think? Can Kante and Matuidi protect French defense? I think this is the key question ahead of this fixture. Belgium boast three standout attacking performers. Eden Hazard and Kevin De Bruyne in particular have produced devastating cameos to set their side on the way to knock out victories. When you add the physicality, pace and power of Romelu Lukaku, France have a job on their hands to stem the influence of these players. The key French players tonight for me are Kante and Matuidi, two standout players for their ability to break opposition attacks. Both players will need to be on point with their tackles as an early yellow card could seriously undermine their ability to negate the running play of Hazard and De Bruyne who will look to slot into space between midfield and Lukaku upfront. If both French midfielders have standout games, France go to the final. Thomas Meunier was heroic in his side’s victory over Brazil. His ability and conditioning to support his attacking colleagues while providing defensive solidity on the flanks despite the threat of Marcelo and Neymar marauding down his channel. His suspension tonight poses a problem for Roberto Martinez. Dembele comes in fill the void but his central midfielder tendencies could potentially see France creating space out wide. It is a position of concern for Belgium when you consider the French attacking threats out wide. Mbappe, Pogba and Griezmann will look to move out to the flank vacated by Meunier to see if there are weak points to be exposed. Where is Paul Pogba’s best position in this French side? Pogba has shown flashes of his undoubted talent in this tournament but there has being long periods where Pogba has struck an isolated figure. Pogba needs to be prominent in the early exchanges; look to run with the ball from deep and perhaps look to launch a coupleof runs from deep to attack the ball in the Belgium penalty area. Deschamps persists with Pogba in the central midfield area but I don’t see the Manchester United player as a defensive protector of his back line. Interesting cameo beckons from Pogba tonight. It is such an intriguing match up and how Deschamps and Martinez tactically setup will be fascinating. Both defenses are standouts in this tournament. Varane and Umtiti have shone for France defensively. Belgium’s back three of Kompany, Vertonghen and Alderweireld have provided the most assured performances with the ball in this tournament. The attacking flair on show hopefully will not be stifled but I sense that both managers will have plans for the opposition star players. Witsel and Fellaini will be asked to negate the influence of Griezmann and Mbappe but then you have the threat of Pogba from deep and Giroud is liable to score a header from absolutely nothing. Same for France, the Belgium front three could potentially cause havoc provided that Hazard and De Bruyne ge the space they require. France to shut down the Belgium front three threat while exposing the absence of Thomas Meunier. France win this contest 2-1. Heartbreak for Belgium. A couple of days past but it would be remiss of yours truly to not comment on the final two World Cup quarter finals held last weekend. England cruised through to the last four while Croatia again huffed and puffed before dispatching the gallant Russians on yet another penalty shootout. Hawkeye Sidekick reflects. There is plenty of work for England to do before it is coming home. We heard that Sweden were a superior outfit to any other team that they have faced in this tournament but Sweden saved their worse performance of the tournament for this quarter final fixture. They were listless (perhaps the early fire alarm wake up call had an effect) and struggled defensively to cope with the pace of Sterling, the goal poaching threat of Kane and the crossing and set piece delivery out wide. Harry Maguire has steady improved as the tournament has progressed. He will probably be the first to admit that he was a nervous wreck against Tunisia but he has settled into the back three of the England defense so much so that he is now posing an attacking threat for England. An emphatic header from yet another clinically executed England set piece to open the scoring. Sweden were behind the eight ball and their blunt attacking threat was exposed and raised questions how they advanced to this stage of the competition. Jordan Pickford has enhanced his reputation from this tourney. His saves during the Colombia game have pushed his game to another level. His confidence is soaring so much so that his distribution from the back is now including excellent sweeping passes to midfield players out wide (seen against Sweden). Pickford was called upon to save his side when Sweden did try to threaten but a clean sheet in the quarter final can only bring good vibes for both the keeper and defensive unit who by and large dominated exchanges. The England midfield continues to grow as well like the rest of the side. Henderson was on point with his defensive duties and ability to pinpoint England attacking runs with quality passes in behind the Swedish defense noteworthy. Henderson has emerged as a doubt for the semi-final; his presence will be required given the threat of Croatia’s midfield with the likes of Modric, Rakitic, Rebic, Perisic. Is Southgate tempted to change the formation to deploy Dier to support Henderson in the middle of the park? England have to be praised for getting to this stage of the tournament. The draw has opened up for them and they have taken full advantage. Precious few gave England a chance of getting out of the second round. You sense that the Colombia triumph for this group of players was the turning point; their ability to win given the arduous circumstances have unleashed the pressure and shackles from the side. Their triumph against Sweden showed composure to close out the game in an efficient manner. Sweden were nullified; their defensive shape was compromised due to England’s pacy attack. Lingard continues to grow into this tournament and with quality delivery from Young and Trippier, Croatia will need to be on point defensively to advance to the final. England are underdogs; they will revel with this tag. I love Croatia and how they complement their physicality with an elegant passing game. The sight of Luka Modric orchestrating the tempo during games is a joy to watch; saw him first hand demolishing Republic of Ireland in Poznan. Modric has being an absolute star of this tournament but his colleagues around him need to up their game. 2-2 against a limited Russian outfit is another reminder to Croatia of vulnerabilities. Their ability to fightback from yet another opening half was admirable but their sheer inability to go on and win contests during regular and extra time is baffling. Chances were created but were spurned. Croatia have just about held their nerve in penalties but this adds to the mental toll ahead of such a key fixture. Croatia’s midfield is the jewel in the crown of their impending fixture against England. If Croatia can provide a platform for Modric to control tempo to create chances for Rebic and Mandzukic then England will be under the cosh and facing World Cup elimination. However, their inability to defend the set piece is a concern in recent games. Denmark and Russia profited from set piece goals and England will not have to be asked twice to punish the Eastern Europeans. Croatia are favorites to progress but they are making life exceedingly difficult for themselves leading into this semi-final fixture. The toll of playing two matches (120 minutes) plus the pressure of executing in a penalty shootout could take its toll and I am starting to wonder if Croatia defensively have not faced the genuine pace possessed by the England attacking options. Dele, Lingard and Sterling have the talent and pace to cause issues for Croatia defensively but whether they get the possession to do this is another factor entirely. Russia exit the competition. They have not disgraced themselves in this tournament. Their loss to Uruguay could have signaled the collapse but Russia dug in against Spain and upset the odds. Their late equalizer from Fernandes was a result of perseverance and hard work. Their ability to take the punches during the contest saw Croatia get increasingly nervous leading to the equalizer. Denis Cheryshev was outstanding for the hosts; his opening strike a contender for goal of the tournament. Their conditioning and fitness was immense; a key factor why they advanced to the last eight. How much did Russia take out of Croatia? All to be revealed on Wednesday night. The opening quarter finals of the FIFA World Cup 2018 tournament saw contrasting fixtures. France were rarely threatened in their victory over a Cavani less Uruguay side. Belgium produced a stunning opening half performance to knock out Brazil from the tournament in one of the games of the tournament. Hawkeye Sidekick reflects on the action. The reaction of Gimenez in the second half was enough. The Atletico Madrid defender struck a figure of desolation and disappointment on the football pitch. He firmly believed that Uruguay could pull off another performance out of the bag to shock France but in truth it never looked like happening. There are still questions about this French outfit. The central midfield cohesion with Pogba in the side looks a distinct work in progress. Pogba has all the attributes; size, physicality, endurance and football ability seen in precious few cameos today. His strength is running with pace at the opposition; it remains to be see how Deschamps can address how to get Pogba centrally involved more frequently in France’s game plan heading into the semi-final. France won this fixture in a canter as soon as Varane took advantage of a massive Uruguay defensive lapse from the free kick just before half-time. The delivery was on point but the split second where Varane lost his marker was fatal for the South American side. The header was emphatic and Uruguay were asked to come out and get back in the contest, something they were incapable of doing. Even with Edison Cavani, Uruguay would have struggled today. The central midfield area for Uruguay lacked the quality on the ball to unleash Stuani and Suarez who failed to register a goal attempt today. It was the hopeful ball down the flanks looking for Stuani to win a 50/50 duel or Suarez looking to benefit from a sloppy French defensive pass. Suarez struck a forlorn figure come the final whistle. The second French goal was a personal disaster for Uruguayan keeper Muslera. The vastly experienced goalkeeper will think long and hard in the coming weeks on how Griezmann’s speculative long range effort evaded him. The ball agonizingly going in was a horrible image for any neutral football fan to see. It spelled the end of the contest. Cue Uruguayan outfield players to collapse in despair at the concession. The white flag was as good as raised. France controlled and game managed the fixture from then on. Uruguay game to the end but France were defensively on point. Kante protecting his central defenders superbly well throughout; no easy ball for Suarez to run and create goal scoring opportunities. They are the team to beat in this tournament; they have cruised through the tournament so far. Will a team be able to put under the cosh and see how the side react? All to be revealed next week then. The game of the tournament so far for me. Forget the opening round games. This was a high quality contest between two footballing sides who gave as good as they got during the ninety minutes. The game was ultimately decided by management of the two sides on show. The ability of one team (Belgium) to adapt and execute an efficient game plan with the correct personnel on the pitch. The other team (Brazil) floundered due to indiscipline and player personnel issues. Belgium won this encounter in an excellent opening half. Their ability to defend in depth with Fellaini and Witzel outstanding providing a protective blanket for the Belgium’s back three was instrumental to this triumph. They consistently broke up game and their quick distribution to Hazard, De Bruyne and Lukaku paid ultimate dividends. Both sides had nervy moments on the set piece early doors. Belgium perhaps a touch fortunate not to concede an early goal but they recovered and took full advantage of chaotic Brazilian defending to lead this contest on thirteen minutes. Kompany winning the initial flick on from a corner. Fernandinho unable to get his head out of the way and the ball was in the net. Brazil management should have instructed their side to keep calm and composed but the players started to over commit to every Brazilian attack. Brazil were outdone by one of the goals of the tournament. A Brazilian corner was cleared and Lukaku rampaging run had Brazil defensively in all sorts of trouble. His pass to De Bruyne was excellent and the strike was emphatic. Marcelo not able to get close due to the player overlap on his flank. 2-0. Belgium had numerous heroes tonight. The front three were such a live threat throughout and exposed Brazil’s weak points in defense. The defensive players in the side were sublime. Meunier was a hero for Belgium having to contend with Marcelo, Neymar throughout. Vertonghen, Kompany and Alderweireld were composed, defended with gusto and organized with leadership. Chadli and Lukaku sacrificed their attacking play to keep Belgium compact and hard to break down. Brazil failed to give up and their attacking threats continued to create chances. Augusto’s goal was a superb effort; deft chip over the top from Coutinho to get Brazil back into the contest. Augusto had another glorious chance soon after with a chance to score from just inside the penalty area; shanked the effort. Neymar was looking to create but was looking to go down at the every opportunity. For such a magnificent player, he really turns me off with his antics. I am glad that we no longer need to see his diving antics in this tournament. The player failed to deliver tonight and Brazilian media will not spare him. The lack of leadership defensively and central midfield as well was galling; Silva and Miranda struggled. Fernandinho’s’ confidence went as soon as he scored the own goal. How Douglas Costa and Renato Augusto were not on from the start is another galling point for Tite to attempt to bat away? Jesus was mediocre at best. His link up play was poor and Firminho was an instant upgrade. Costa and Augusto were involved in all that was good with Brazil in that second half. Tite’s blind loyalty to certain players ultimately cost his side tonight. Kudos to Roberto Martinez; a man who was greeted with indifference when appointed to this national team job. His passing football philosophy is known but his ability to get his team to adapt and execute a swift counter attacking formation tonight really shone through. Martinez will be a man in demand; his humble post match interview spoke volumes. Martinez and management staff won this contest. Martinez will be a man in serious demand after this tourney. As the final whistle blew in Kaliningrad tonight, so it signaled the end of the group phase. This stage of the tournament has seen varying levels of performance from the fancied side so far. Hawkeye Sidekick reflects on the group phase and picks out some high and low points. We have seen the good, the bad and the downright ugly when it comes to VAR in this tournament. The good has being the ability of the VAR crew to alert the match officials to key incidents; some excellent VAR decisions were made during this stage, thinking in relation to penalty calls (some) and overturning decisions which were incorrect. However, the sheer inconsistency of the technology in some games has caused massive issues. The Portugal vs. Iran game was a low point for VAR; dubious penalty calls and then the Ronaldo elbow incident highlighted what bother with the system when the superstar was issued a yellow card. Iran felt robbed. The lack of transparency in the VAR decisions has left people speculating on the decision making process. If the communication channels were open for all, then it would address the question on how decisions were made? The sheer inconsistency of officiating crews to clamp down on defenders man handling attackers in the box has being a low point too. Work to do with VAR but there have being positives. The scenes yesterday were incredible. As South Korea scored a second injury time goal, questions aplenty for German management and squad. All need to take some portion of blame. The squad selection raised questions before this tournament. Sane’s omission was a shock as the Manchester City player had an excellent season. The same could not be said for the likes of Draxler. A strange omission and it set the tone for the tournament. Neuer in goal lacked game time before this tournament and it showed in the group phase. The image of Neuer being dispossessed by South Korea far out from goal is for me the summary of Germany’s problems. Lack of precision on both sides of the ball proved fatal. Yes, there was the Sweden win but defensive shape was an issue and the attacking misfires ultimately drew blanks against Mexico and South Korea. Germany will be back but surely with a new voice at the helm. The players lacked drive. Leadership on the park was strangely muted. Management need to review clear issues in the cohesion of the side; defensive duties were at times treated with contempt by some German outfield players causing massive defensive overlap issues in the process. Given their struggles, Germany can have no excuses about their elimination. The most unluckiest team of the tournament was Senegal. I enjoyed their cameo in the tournament. Big and physical and their fast tempo game plan with Mane prominent caused Group G oppositions issues. Their physicality though meant that they tallied yellow cards and this proved decisive in their elimination. Senegal will rue late lapses in their opening games. The late Poland goal concession for goal difference perspective. The late equalizer conceded to Japan in their second game was pivotal too; more than deserved a win here and it opened the door for today’s events which saw the African side play it safe only to be done by a late Colombia goal. Attacking threat came far too late. A bitter end to the tournament for Senegal. Issues aplenty for Argentina in this group phase but they managed to advance to the last sixteen. The issues defensively were hardly a surprise given their struggles to even qualify for the World Cup itself. The goalkeeping and defensive cohesion was an issue from the opening fixture. Croatia exposed this weak point ruthlessly in their second game. Nigeria should have but failed to inflict the killer blow. Messi has arrived to the tournament with his sublime effort against Nigeria. Banega’s influence on the Nigerian game gives hope for Argentinian supporters that they could beat a France side who have flattered to deceive. Pavon’s cameo last time out also provides a good attacking threat but questions on why Dybala has not featured remain? A tough second round encounter beckons for Argentina though given the defensive and goalkeeping situation. Spain, France, Portugal, Brazil, Belgium have secured second round qualification but some of the performances have underwhelmed. France’s squad looks potent but no clear cohesion yet in the side. Spain have struggled defensively and their attacking goal threat has being assigned solely on Diego Costa. Portugal looked great against Spain but have gone back to defensive first prototype in subsequent games. Brazil have grown into the tournament but still question their defense nous at the business end of the tournament along with Belgium who looked destined to face off in a quarter final. With Croatia looking a prime tournament threat, these teams need to deliver now and deliver to the fullest performance levels. I suspect a couple of fancied teams will be on their way home come the end of the second round. No standout right now and it is now time for teams to deliver. Russia to upset Spain for me. Spain are in chaos from a managerial perspective, squad unity looks less than solid. The loss tonight is perhaps a nice reality check for England. It showed squad depth chart issues particularly in the midfield area. Dier and Delph were exposed tonight; looked ring rusty for long periods. Vardy and potentially Rashford were the standouts for England tonight but the dependency on Harry Kane and his goals was shown again tonight. The Rashford chance tonight should have being a goal, key opportunity lost from Rashford to start against Colombia. The pleasing part for England has being the ability of the defense to come out and pass it out from the back. Pickford has being solid in goals and his distribution has being excellent. Squad players got game time but for the majority tonight, that will be the last they will feature in this tournament. The England team to face Colombia picks itself which for Gareth Southgate has to be a disappointment.